"Sampath Speaking" - the thoughts of an Insurer from Thiruvallikkeni: Madras High Court directs - NSC Bose Road to be hawker-free !! Madras High Court directs - NSC Bose Road to be hawker-free !! Nixing Chennai Corporation's bid to allow hawkers on the busy NSC Bose Road stretch between Parry's Corner and Flower Bazaar police station, the Madras high court on 13.10.2015, asked it to maintain the stretch as a no-hawking zone in accordance with a 2013 Supreme Court order. 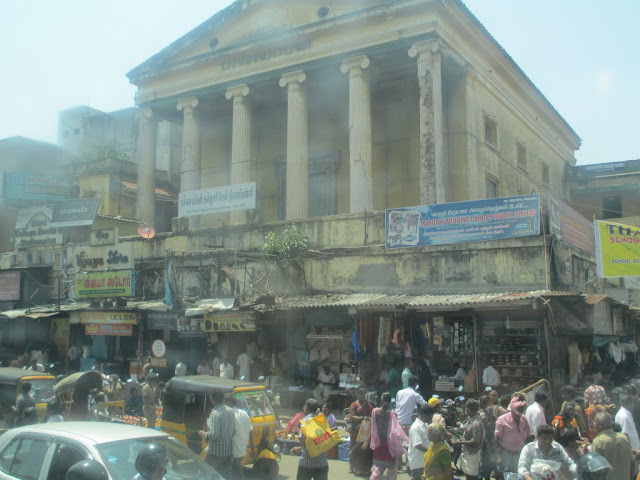 Chennaites know this road too well ~it has great history and has so many landmarks along. A busy thoroughfare – on the one end is Parrys Corner [Madras High Court]; Rajaji statue – Kuralagam, Broadway bus stand [from where buses to various parts of Tamilnadu once operated]; Chennai Telephone exchange; Flower Bazaar Police station nearer which the statue of British King George V stands – there are many important roads branching off – Lingi Chetty St., ThambuChetty St., Armenian Street, Broadway [PrakasamSalai], Badrian Street, Malayaperumal St., Godown Street ~from GovindappaNaicken St, its texture changes. It goes on to connect Wall Tax Road, now VOC Salai. All along there are many commercial establishments including Hotel SaravanaBhavan, Dare House, Bombay Mutual Building, Ramakrishna Sweets, Pachaiyappa Hall and more. This area known as Black town during colonial period came to be called as George Town from 1911 when King George V ascended the throne. The colonial past and his statue still remain. One can find lot of fruit sellers and other small time hawkers all along the road – it is a virtual paradise for sellers displaying so many wares…… .. Today’s Times of India and other media report that Madras high court has asked it to maintain the stretch as a no-hawking zone in accordance with a 2013 Supreme Court order. “We direct the corporation commissioner of Chennai, and additional commissioner of police, Chennai city traffic, to take necessary action and ensure that the area is cleared of all encroachments and is maintained as a no-hawking zone,“ said the first bench of Chief Justice Sanjay KishanKaul and Justice T S Sivagnanam. Chennai, or for that matter any other town in Tamil Nadu, has neither a hawking policy nor zone. 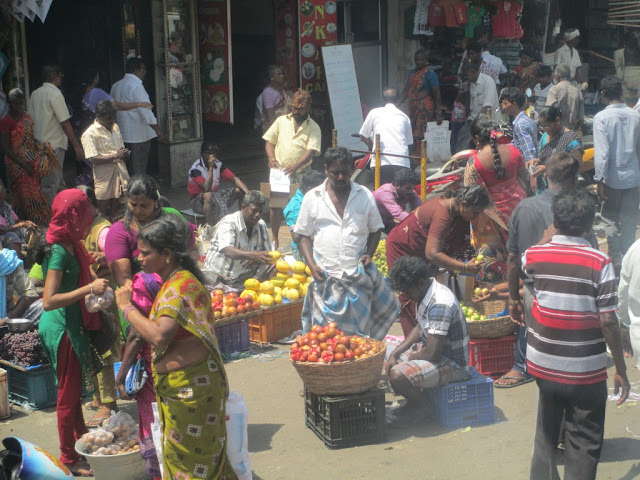 Chennai Corporation is yet to constitute a Town Vending Committee to regulate hawkers despite the SC passing an order to this effect on September 2013. The LokSabha passed the Street Vendors (Protection of Livelihood and Regulation of Street Vending) Bill on September 6, 2013. Three days later, the SC asked all states to form TVCs within two months and register vendors within four months.The city has around 3,966 registered hawkers but more than 1 lakh operate without a licence. The Street Vendors Bill sets the maximum number of hawkers at 2.5% a city's population. Chennai, with a population of 65 lakh, can have 1.62 lakh hawkers or an additional 50,000. The corporation has to register all of them and provide them with dedicated hawking spaces and identity cards. The first bench passed the order on Tuesday after social activist K R `Traffic' Ramaswamy brought the encroachment menace, the corporation's plan to create hawking space on the stretch and the apex court's existing order declaring the area as a nohawking zone to its notice.He was referring to a 1996 judgment of the Supreme Court, following which 794 hawkers on NSC Bose Road and Evening Bazaar Road were relocated to alternative sites at four different locations, including NSC Bose Road.